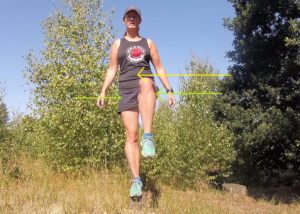 Do your legs hurt when you run on uneven ground? Are you susceptible to turning your ankles or tripping over? Or do you find that you ache all over when running longer distances? If you work on improving your strength, your body will cope more easily with running on rough terrain. If you build trail-specific strength, it will manage even better! There's nothing complicated about becoming stronger - in fact it's the simple things that will make the most difference! Whatever you need to work on to improve your strength, I can help. Take a look at the 'Stronger, faster' session below, or contact me if you'd prefer some one-to-one coaching. 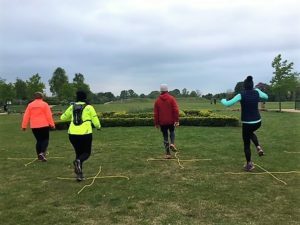 This 90-minute, small group (max size 10) session will teach you a range of simple, body-weight based strength and conditioning exercises, focusing on the key muscle groups and movements used when run off-road. By the end of the session, you'll have acquired a repertoire of moves that you can do yourself at home, with no special equipment needed. Whether you are an experienced runner or just taking up the sport, this workshop will help you become a stronger runner, a faster runner, and less prone to injury. Trail and road runners welcome! 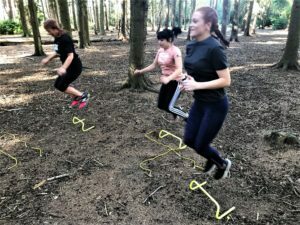 'Hill skills' sessions take place all year round at weekends, and on weekday evenings in summer too, at various locations in the Newark / Grantham / Lincoln areas. "Thanks so much for the workshop today. I really got a lot from it. My core muscles are a bit achey today so I know I definitely worked something there!"